Since the accident at Fukushima Daiichi in March 2011 and the subsequent shutdown of nuclear reactors in Japan, five reactors have received approval to restart operations under the new safety standards imposed by Japan's Nuclear Regulation Authority (NRA). Only three of those reactors are currently operating. Applications for the restart of 21 other reactors, including 1 under construction, are under review by the NRA. Some reactors that meet the new NRA safety standards and have been approved to restart continue to face legal or political opposition that may delay or forestall their restart. After the Fukushima accident, all 54 of Japan's reactors were shut down. Twelve reactors totaling 7.2 gigawatts (GW) were permanently closed. Restart applications for 20 previously operating reactors (totaling 19.5 GW) and 1 new reactor under construction (the 1.4 GW Oma Nuclear Power Station) have been filed with the NRA. 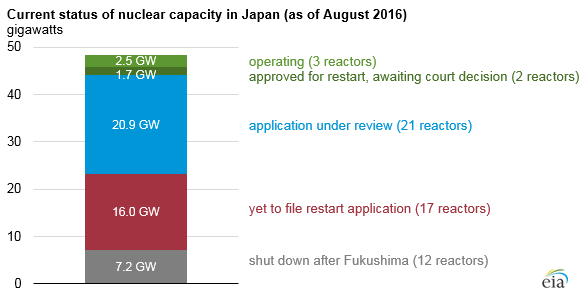 The remaining 17 reactors (16 GW) have yet to submit restart applications. There is still uncertainty about whether some of these reactors can meet the new NRA safety regulations, particularly regulations regarding the ability to withstand severe earthquakes. In addition to NRA approval, the restart of Japan's nuclear reactors requires the approval of the central government and the consent of local governments or prefectures where the power plants are located. Opposition to reactor restarts has been primarily related to public concerns about seismic risks, the adequacy of NRA regulations, and evacuation plans in the event of an accident. Kyushu Electric Power Company's Sendai Units 1 and 2 (1.7 GW combined) are located in the Kagoshima prefecture and received NRA approval to restart in May 2015, slightly less than two years after submitting applications to restart. In August 2015, Sendai Unit 1 was the first reactor to be restarted under the NRA's new safety regulations, with Sendai Unit 2 following in October. The reactors are scheduled to shut down for periodic inspection and maintenance in October and December 2016, and post-outage restarts may be delayed in light of the recent call by the newly elected prefectural governors for the temporary suspension of operations at Sendai. Kansai Electric Power Company's Takahama Units 3 and 4 (1.7 GW combined) in the Fukui prefecture received NRA restart approval in February 2015. Although the reactors briefly restarted in early 2016, a district court in the neighboring Shiga prefecture issued an injunction in March to shut down the two reactors. That court's decision was reaffirmed in June and again in July following challenges by Kansai Electric. Kansai Electric filed an appeal with the Osaka High Court in late July seeking to lift the injunction. Shikoku Electric Power Company's Ikata Unit 3 (0.8 GW) is located in the Ehime prefecture. The NRA approved restart in August 2016. The reactor began generating electricity in August 2016 and is expected to resume commercial operation in September. In July 2016, Japan's Institute of Energy Economics (IEEJ) analyzed low, reference, and high reactor restart scenarios for fiscal years 2016 (ending March 2017) and 2017 (ending March 2018). The High case envisions that as many as 25 reactors may restart by March 2018, compared with 12 in the Low case. The continued uncertainty related to the length of the NRA review process, the difficulty in getting local consent, and the potential for protracted court proceedings can all affect both the actual level and timing of nuclear capacity restoration.